The purpose of this exhibition is to highlight aspects of flânerie that relate to acts of creativity in contemporary visual art because the artist as flâneur/ flâneuse is an intriguing and complex individual in a global society. Examples of their identity are revealed in this exhibition of photo-media, painting, printmedia, digital art, multi-channel video, and sculpture and installation, by six established artists from Norway, UK, USA, Germany and Australia. Flânerie from the C16th simply referred to acts of strolling or idling. With an interest in modern city life, the French Romantic poet, Charles Baudelaire (1821) portrayed the flâneur as a gentleman stroller of the streets, open-minded and unprejudiced, wandering without aim, a reflective observer of circumstance, a lover of the crowd. Baudelaire wrote: "The crowd is his element, as the air is that of birds and water of fishes. His passion and profession are to become one flesh with the crowd. For the perfect flâneur, for the passionate spectator, it is an immense joy to set up house in the middle of the multitude, amid the ebb and flow of movement, in the midst of the fugitive and the infinite." The subject of flânerie has inspired many writers, artists and philosophers since the last century. For example, the spectator was a central figure of modernity strolling around the iron and glass covered arcades of 19th century Paris (Walter Benjamin); the man who strategically shelters himself within the crowd (Edgar Alan Poe); the surrealist devising random chance situations that reveal the real nature of the city; the flâneuse with her own private experience of modernity (Janet Wolff); the traveller directed and informed by aesthetic encounters arising from the urban terrain, a process known as dériving or drifting (Guy Debord)1. Within the arts the writer and philosopher Susan Sontag saw parallels between the flâneur and the photographer. She said “In fact, photography first comes into its own as an extension of the eye of the middle-class flâneur…The photographer is an armed version of the solitary walker reconnoitering, stalking, cruising the urban inferno, the voyeuristic stroller who discovers the city as a landscape of voluptuous extremes. Adept of the joys of watching, connoisseur of empathy, the flâneur finds the world ‘picturesque”2. International cities undergo constant transformation. In the 21st century many leading cities throughout the world are ranked according to political, economic and cultural objectives, infrastructure efficiency, and the ability to influence and contribute to global finance and trade. They may be referred to as: Global or World cities; Alpha, Beta, Gamma cities; Mega cities or Sufficiency or High Sufficiency cities. New York and London are Alpha ++ cities (Beaverstock, Smith, Taylor)3. Ranked second, Paris, Tokyo and Sydney are Alpha + cities. It is thought that in the future over 75% of the world’s population will be urban. Over 20 million inhabitants will reside in mega-cities undergoing rapid development in Asia, Africa and South America. On the flip side European cities appear to be shrinking. (Burdett)4. Today’s city can be a dangerous and costly place. The pedestrian moves with the mesmerizing flow of shoppers, tourists, workers, commuters, eaters, buskers, peddlers, and nomads of all calling. The air is polluted and streets are noisy with traffic and signage. Public space is dominated by corporate buildings, concrete overpasses and thoroughfares to facilitate flow. Shopping malls, restaurants, cafes, parks and gardens provide an alternate time for reflection if one can afford to loiter. The aim for the average visitor is to have a strategy to enter, obtain, and then exit the streets to be elsewhere urban, and most likely inside. Experiencing city life via iPhone, tablet, computer, or home theatre provides a safer, cheaper, if not more attractive option. World art centres attract international artist travellers to research, produce, network, and transfer ideas within a broad artist community of shared values. Leading galleries, museums, biennales, art fairs offer artists the opportunity to further their careers. Artists opt for city life to attend university, or, maintain studios in converted factories located near eclectic suburbs. Microcosms of city life stimulate, abstract, and reshuffle imagery and information within a pre-existing framework of artist knowledge, experience and values. The artist’s relationship to the city is one of mutual benefit and dependence. S/he observes and reflects the city in perpetual change. The geographically mobile, digitally equipped, artist flâneur/ flâneuse connects with the city of today through accessible global travel, through cyberspace, and like the 19th century heroic flâneur, through types of walking. Perhaps what is different is the sense of conviction, perhaps addiction, for the consumption of visual information about any topic suitable for immediate dispatch, as creative thought, digital archive, or expressed within a variety of overlapping art forms. The choices available to visual artists are far greater now, than they have ever been. Judith Duquemin and Anke Stäcker have brought together a number of artists for this artist curated exhibition to raise awareness about the subject of flânerie in art, and to strengthen conceptual elements that support their creative investigations. The subject of flânerie in this exhibition is communicated through the motivations, methods and materials associated with each work rather than, an illustration of the text. Recent international exhibitions about flânerie include: Person of the Crowd featuring many of the world’s leading artists. It was curated by Thom Collins, Director of the Neuberger Museum of Art, State University of New York, Purchase, NY, 2008, and contemporary flânerie: reconfiguring cities, Oakland University Art Gallery, Rochester MI, 2009, curated by Vagner M. Whitehead, whose video installation appears in the exhibition. For Whitehead, the mind’s wanderings are as important as the body in motion, providing a greater understanding between space and self, and city and identity. 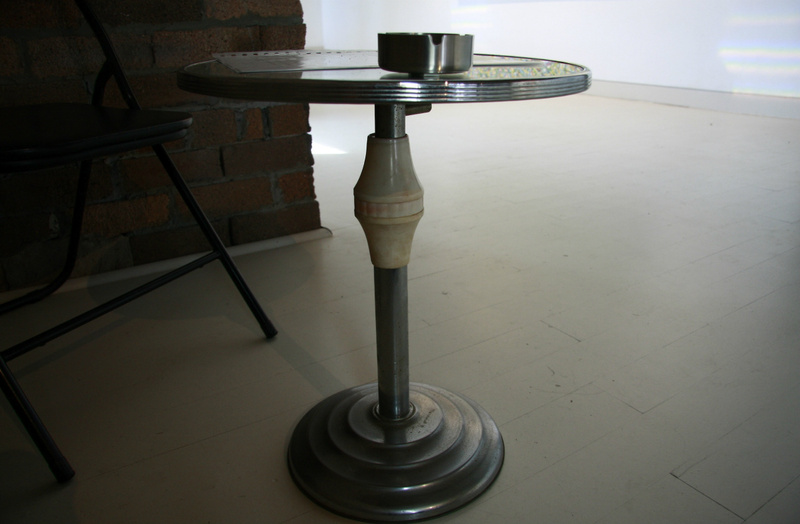 He works with time-based and traditional media to provide a parallel interpretation of the urban observer. “His works employ original, appropriated, and researched multi-lingual texts, found and created photo-based imagery, their translations and his interpretations, as allegorical devices that reframe trans-cultural experiences visa-vis mass media and communication technologies”1. 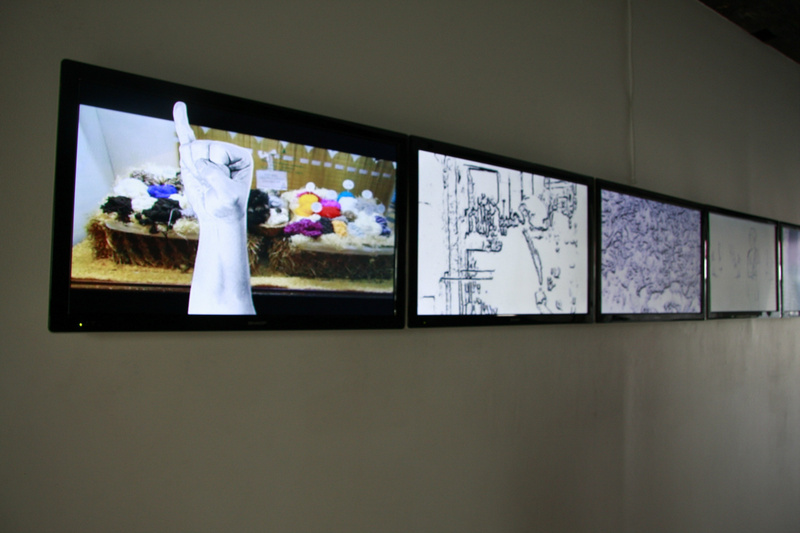 Silver Code, a multi-channel video presentation composed of five works, explores an interest in American sign language. The project originated at Residencia Corazon in La Plata BA Argentina. 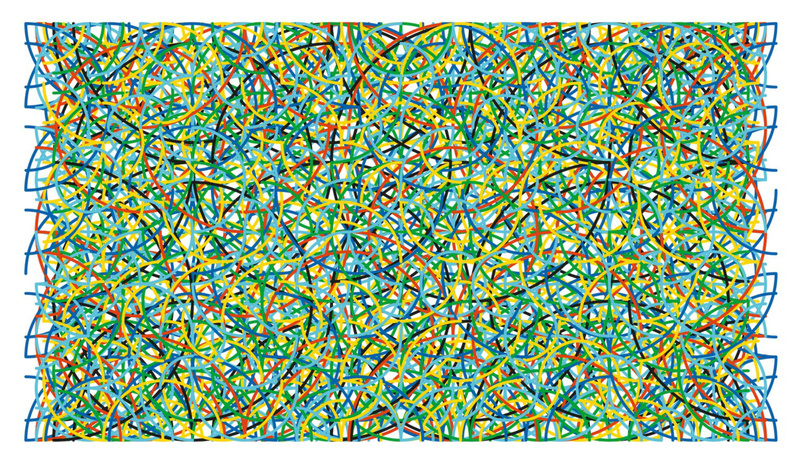 On the behaviours of looking and seeing, Per Formo has used simple rules and formal structures applied to abstraction to create Untitled a large digital image made up of many, colourful, different sized, overlapping, diagrammatic circles, that appear to merge and meander, sometimes breaking up in the multitude. He constructs what he calls ‘visual situations’ using techniques of digital image making and painting to create images that disturb the automatism of visual perception, by leading the eye to look closer and longer and differently, perhaps as a result of illusionism, complexity, intensity, surprise, strangeness, repulsion. Visualizing he says, is not a given. Per lives and works in Trondheim, a 1000 year old city in Norway. The remaining artists in the exhibition are women. The use of the word flâneuse is widely considered to be distinct from the flâneur which has become a popular metaphor for the modern artist. Women as observers and artists have an increased presence in the city of today unlike their 19th century counterparts. Women then, who occupied the city, risked being labeled ‘prostitute’, ‘widow’, ‘old woman’, ‘lesbian’, object of the male gaze. It appears from the literature, that the definition of flâneuse is unresolved and to avoid misconceptions about the gendered nature of flânerie, ‘flâneur’ is a term applied to both genders in this exhibition. It is the subject of flânerie that is of greater importance. For want of a word, the ‘passante’ referred to by Baudelaire as an enigmatic icon or unknown woman who cannot easily be defined or controlled, is a more flattering description of the female artist who engages with contemporary flânerie! The ordinary becomes the extraordinary in Marlene Sarroff’s Random Accumulations 1&2. 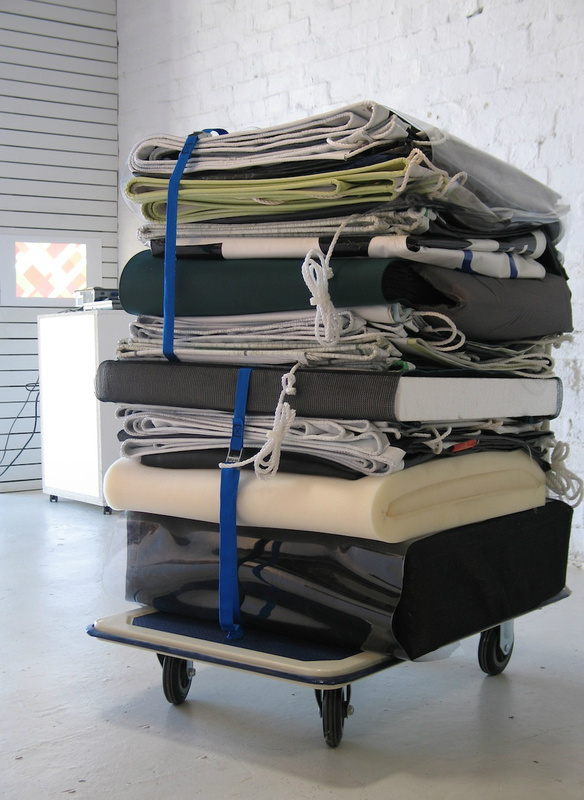 Found ready-mades and discarded materials from industrial sites such as banners, rope, sponge, boxing and mesh, coloured cords, strapping, synthetic foam, plastic, elastic, a vinyl cushion…form combinations of materials of different dimension, texture, colour and use, to become two freestanding stacks of carefully wrapped tablets positioned on portable, moveable trolleys. Each stack appearing similar though made different depending on the appearance, history, interpretation and randomness of the items acquired. Marlene’s third work is a set of colourful plastic strips slouched over an oversized nail on the second floor. 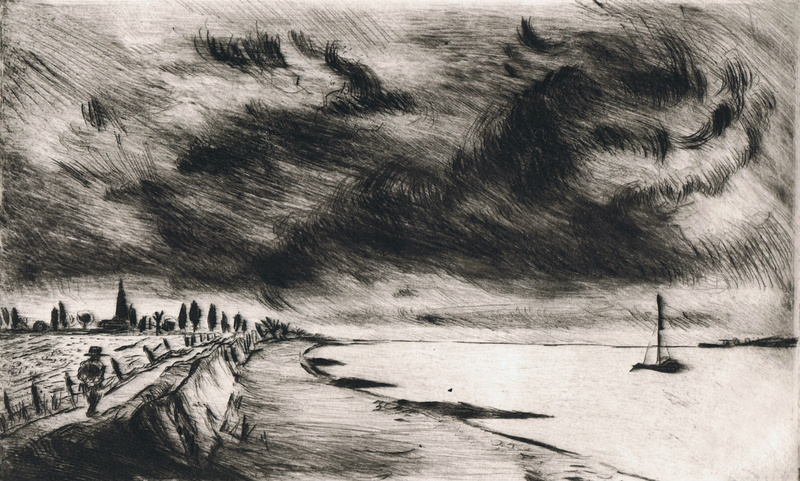 The etching Rhein Wanderer, hanging within a mock café setting, is an evocative portrayal of Milein Cosman’s father walking along the Rhein (Rhine) river in Germany. Cosman was born during the time of the Weimar Republic (1919). She departed Germany three weeks before the outbreak of WW II to attend the Slade School of Art in England where she studied drawing. There, and later in London she met and drew many leading artists, writers and musicians of the 20th century including Igor Stravinsky, Wilhelm Furtwängler, Yehudi Menuhin, Francis Bacon, Ernst Gombrich, Iris Murdoch, Barbara Hepworth, TS Eliot and, her husband Hans Keller. Duquemin met Milein, then aged 94 at her home in Hampstead, London while travelling and working in the UK during 2012. 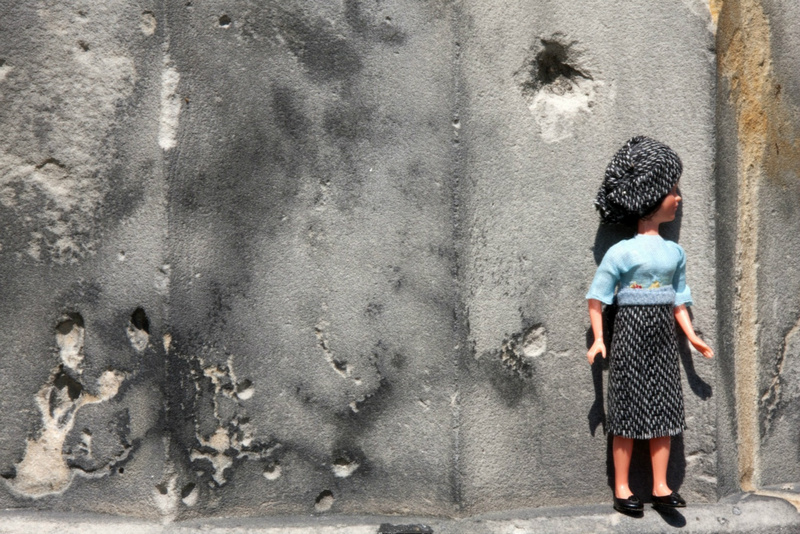 A grown up doll takes a walk in Berlin for the series of photographs by Anke Stäcker, titled: Gerda: Berlin Revisited. Gerda (a doll) was found in a village in France dressed in provincial costume2. She was redressed in chic city garb, a hat and pencil skirt and taken to Berlin. Gerda is photographed by Anke (in Berlin) as observer, historian, detective, and a stand-in for Anke’s own experiences of a divided Berlin during the time of the Cold War. In seven of the images throughout the gallery, she is photographed appearing in iconic places like the television tower (Fernsehturm), the victory column (Siegessäule), Alexanderplatz, the Museum Island (Museums Insel), the Reichstags building (Reichstag) and the airport Tempelhof. Like the flâneur, Gerda in Berlin “is the precursor of a particular form of enquiry that seeks to read the history of a culture from its public spaces” (Gleber)3. Travelling between the hemispheres to observe differences in atmospheric light and colour has been a pre-occupation for painter Judith Duquemin since 2009. She has applied her observations of flowers to Painting for Reconstruction: Spectral Trapezoidal Icositetrahedron. Each point in the polyhedron is intercepted by a corresponding twelve part spectrum. Using a formula of sectioned hard-edged colour-fields that lighten and converge towards a central point, a luminescent polyhedron is formed. The image is created for digital reconstruction. Other works in the exhibition include the digital projection Reconstructed Painting: Red, a digitally reconstructed painting, and Scottish Encounters, an acrylic on canvas resulting from travel and work in Scotland. The narrow street-like interior of Articulate project space offers the art observer a conscious and thought provoking opportunity to enter into the role of the flâneur to appreciate how flânerie applies to contemporary visual arts practice within a variety of interpretations and mediums. 3 "The World According to GaWC 2010". Globalization and World Cities (GaWC) Study Group and Network. Loughborough University. http://www.lboro.ac.uk/gawc/world2010.html. Per Formo, Untitled, digital image for print on canvas, 2012. 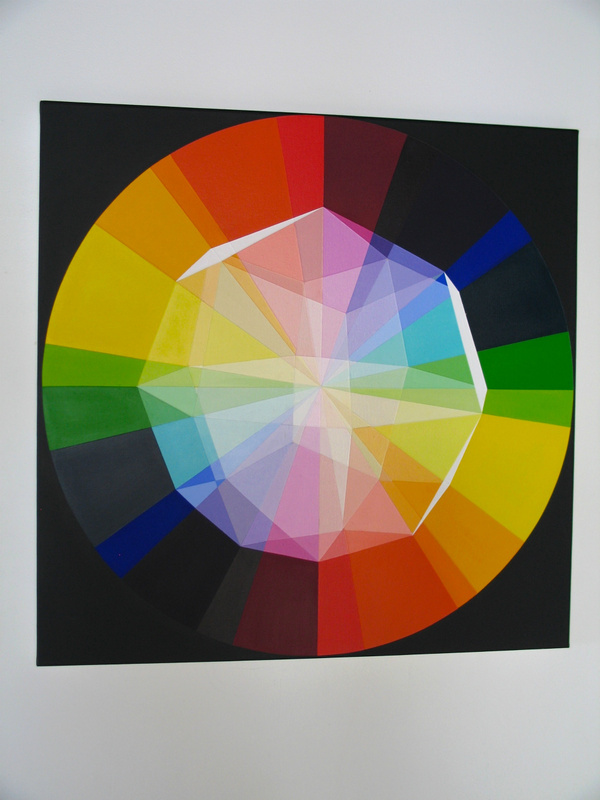 Judith Duquemin, Painting for Reconstruction: Spectral Trapezoidal Icositetrahedron, acrylic on canvas, 2013.